At Beta Holdings, we aim to please our customers. Having carried out extensive research in early 2012,we know what you, our customers, want and need from us in order to have a satisfying experience. 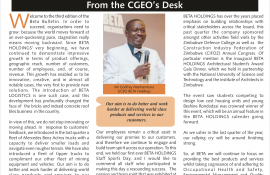 The third quarter, will see a breath of fresh air blowing through Beta Holdings in our everyday operations, as we make adjustments and improvements for all our stakeholders both internally and externally. With so much happening all the time, we wish to announce to you, two of our current projects: The launch of our logistics division and the unveiling of our new cleaner modern logo. Today is an extremely proud day for all of us at Beta, a new day for us all. We are excited to announce the Beta Logistics Division. We are in the final stages of creating this new exciting venture. The Beta Logistics Division will be operating in the third quarter of 2012, yet another move forward to ensure that all our business operations are seamless and meet our customer needs and expectations. Efficient, high quality, cost effective products and services. Logistics operations are ultimately a differentiating factor for any business and this is why we have taken this direction. The Beta Holdings Group we understands that logistics management is a crucial part of any supply chain which; plans, implements and controls the efficient and effective movement of goods. In our ongoing bid to ensure that we provide a seamless supply chain to all our customers; the Beta Logistics division will be an arm of the business, which supports all transportation needs, from collection and delivery of raw materials to the delivery of the final product to the consumer. for your bricks to be loaded and dispatched. Beta Logistics has gone one step further than simply buying trucks for transportation, in order to ensure our customer satisfaction, all our trucks will have a fleet management system which will translate to customers getting their delivery not long after it has been dispatched. The routes and movements of the delivery trucks will be monitored to ensure that the packages will not take any detours. With satellite surveillance on all our trucks, should there be an unforeseen delay or problem; a phone call from the Logistics Division will inform you where your delivery is and the reason for the delay. A team of well-trained and skilled mechanics and drivers will ensure that Beta Logistics vehicles will be road worthy and reliable; allowing for the prompt and safe delivery of all material and products. Our qualified team of fleet managers and inventory specialists, will ensure that we will be able to handle more cargo, reduce pilferage and breakages. As we take control of our logistics and create a meaningful contribution to our customers, we are taking responsibility for the cost and quality of our products. We look forward to the day when all our customers will enjoy the benefits of good quality, cost effective delivery of their purchases. As our trucks get ready to move out onto the road we are branding them with our updated logo. No, we do not have a new logo, what we have is our logo, only Beta! We have made it cleaner, streamlined and more modern, in line with our company progression as a whole. Our logo, is our voice in the visual world and we felt that it needed to be more in line with who we are today and who we are working to be tomorrow. We know that an updated brand is not going to change our company overnight; all we want is for, you, our customer, to know that we have heard all that you said to us and about us and are working on rectifying our weaknesses and polishing up our strengths. As we implement all the various systems to ensure that you get the best quality product and service, we want you to know that we are doing everything we can to be a company our customers deserve, a Beta Company not just the best company. We think we are getting this done, one step at a time and our updated logo represents this. What do you think? We are looking forward to your feedback so please do let us know what you think the next time you are in our sales room.